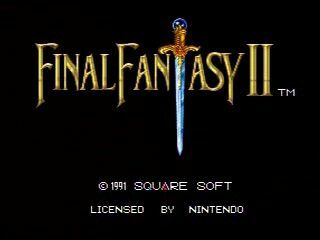 Released in October 1991, Final Fantasy II is an easier version of Japan's Final Fantasy IV. Join the feared Dark Knight of Baron, Cecil, as he sets out to bring a 'package' to the nearby town of Mist. Things don't quite go as planned and Cecil and his newfound allies must embark on a journey that takes them to foreign lands, the underworld, and even to the moon! Timing note: For older submissions, game's timer is referenced at its last visible point, then real time from then to the end of the final attack is added. Resulting time is rounded up to the next whole minute since the game timer could have been :59 seconds at the last visible moment. For new submissions, real time is used all the way through. Best time: 3:05 by Robin 'Deign' Reigstad on 2008-01-23. Best time: Single-segment 3:21 by Andrew 'RaneofSoTN' Melnyk on 2012-08-13. Best time with resets: Single-segment 3:24:33 by Shawn 'Obdajr.' Nakashima on 2013-05-04. Best Single-segment time with resets and large-skip glitches: 1:57:20 by 'the_roth' on 2015-03-28. 3:05 by Robin Reigstad, done in 32 segments. After starting my TAS for this game, I discovered a glitch that would improve Enhasa's run by about 10min or so. It is the glitch that is displayed in segments 27 and 28. Nitrodon, a fellow TASer, discovered another glitch that is displayed in segments 29 and 32. With these 2 glitches, I started my run for this game, my goal was 3:30. I soon found out that after Kainazzo I was already about 7 minutes ahead of Enhasa's run. My new estimate was about 3:20 and really stretching for 3:15. Soon after I completely destroyed Enhasa's time during the Cal/Brena and Golbez segment, I thought 3:10 was the time to beat. Eventually though, I got it down to exactly 3:05. I'm quite satisfied with this time and suspect that 3:03 and MAYBE 3:02 would be possible, but not without a LOT of effort. While making this run my cartridge decided to dump all data except for the bottom save. This left me with 2 segments that I wasn't entirely happy with. You can see this at the begining of segments 13, where the top save is mysteriously empty. It also happened when I was still doing segment 15. This was very upsetting because that is by far the worst segment of the entire run. There was a few spots (mostly in the last couple segments) where I messed up with the walking, but I was very very borderline 2:54 & 2:55 before I got to Zeromus, so these tiny mistakes wouldn't have made a lick of difference. This is why the Rosa leveling although about 30 seconds slow, would not have improved my end game time had I perfected it like the 2nd leveling segment. Concerning the Cal/Brena Golbez segment, I would like to reiterate this quote from Enhasa "People have a hard time believing this, but it really is impossible to get Kain into the air versus Golbez at low levels." Indeed it is near impossible but there's an 8 frame window (note that this is only .13 seconds) for when you gain control of the cursor to select jump and select Golbez. Timing for this was tested on an emulator while doing a test run for the TAS. Most of the improvements that are not related to the glitches are a result of better boss strategies, reducing the number of random encounters, not saving as much, not visiting the item shop in Baron, not entering the menu except when it's already being opened to save (i.e. changing characters around and equipping items just before saving), this includes never equiping a weapon out of combat except for Rydia and Rosa because I was already equipping other items that i couldn't equip in battle, Kain is the other exception because I wanted him ready to go ASAP against Rubicant, getting the Change Rod and Tiara which nearly doubled Rydia's dmg, and not getting the Crystal sword. There's another trick that's abusable to reduce the in-game time. This trick is pausing during attack animations. This, however, I feel shouldn't be used at all. This compromises the in-game timer and therefore makes it unreliable. For this reason I did not use this trick for the run in order to preserve the integrity of this timer. I did not want to reveal the information about the glitches or the strategies here so that people could watch the run and find out then and hopefully be a little bit suprised. Okay so this is an improvement to my previous run here on sda. There is not really a lot more to talk about in regards to my old run. There is enough here to show that there was a dramatic increase in well routing, planning, and some executions. 1. All battles are fought on battlespeed 1 (except the final boss) - I used to switch to battlespeed to for goblez and on to ensure the Kain Jump is successfully performed. I dropped this and my window to get the jump by going to battlespeed 1 cause it saves soo much time. a. The final boss is fought at battlespeed 3 instead of 4, for the same reason as above. it saves even time with text displaying in battle. 2. Discovery of the "MP Underflow glitch" and abusing the crap out of it to meteo some annoying bosses - I meteo Baigan and the 3 annoying sisters of wall-all-day. This saves me minutes in compared to my old run, and is a huge part of the the improvement. 3. Less time spent finding the encounter for the grind in the giant. 4. A few bosses have their strats slightly changed around to accommodate the new battle speed changes. Last time I tried to include a list of splits with the times as an image and that didn't work out so well, so at the end of my comments i'll have a little "quick table" of references for my times at each point in the game. There is plenty more to discuss but most of the rest is just bad luck and doesn't amount to much, there is maybe 5 more minutes of reliable time that can be cut out of the run, but i saved soo much time from other random factors this run will be hard to beat without a significant route change, or matching/beating my luck. If there a lot of questions, i can try to answer them in the FF4 thread in the casual section of the forum, i'm usually pretty quick to answer up! If you want a script of "As the Tower Turns..." Talk to good sir EMPTYEYE not me. Single-segment with resets: 3:24:33 by Shawn Nakashima. Note: The StatID lists a different time. As usual, I like starting off with my thank yous, so here they go. - Shout outs go to the runners of the game who largly developed the speed run route: Deign, Raneofsotn, and HumbleSDA come to mind. They were the ones who did most of the hard word on this game. - and Finally, Shout outs to all my awesome stream viewers, who loyaly watch me get trolled by RNG run after run. -shout outs to me too... im pretty awesome right? If you want information about the route or anything, just check out my info section at www.twitch.tv/Obdajr. It has links for videos to explain the glitches and route that I use. also feel free to get in contact with me on SDA or twitch for any questions regarding decisions. The main reason the time on this run is so good is because my encounter luck was quite a bit above average. Most boss fights went good, but I had a lot of small mistakes. -attacked too early, hit before weak landed. Hope you enjoy the run! see you next time! Single-segment With resets and large-skip glitches: 1:57:20 by 'the_roth'. - Nocashnocash, neerrm, elmagus (HNAARGH), deuceler, puwexil, fyreball13 and catastrophic4 for either helping me stream, helping improve the run over the past year, or even with offering suggestions that lead to improvements. The FFIV community in general has been great – we are a tight group of people and very supportive of each other. - Pressing A at a certain audio cue on the title screen allows you to get no encounters (seed 92) before the Mist Skip. You have to take a misstep in Baron though. - I pause a lot during battles to manipulate the in game timer for going through a room (-46) in the 64 door glitch that changes every second. - TheLCC discovered that you can plink menus to achieve double inputs (like quickly selecting Kain's Jump command against Mist Dragon). Mist Skip – Resetting twice - You lose the item dupe if you get an encounter before selling your shields..
Guard fight – Killing the 3 guards before they attack is possible with run buffering (halts ATB and is abused throughout the game). Sadly this doesn't happen. Octomamm – Decent fight. Casting stop on yourself is useful! I start moving items to the bottom, and save/reset to skip the Damcyan cutscene. Cecil is moved down for Fabul. Hovercraft parked directly left of Mt. Hobs for the 64 door glitch (room -7). Decent Yang luck before Mombomb. Run buffering avoids Mombomb attacking twice if bad damage happens. Fabul - Yang overtakes Cecil and has a chance to one shot fighters. Unequip the Fire Claw at the end so the Ice Claw isn't needed. Cecil saves the day against Kain. Mysidia – Buy equipment first, goes directly to the top. Item buying looks weird but my GP needs to be within a 256 GP range later on for the 64 door glitch (room -47). Guards/Yang - Moving more items here and equipping in battle. I have some pretty crazy luck with encounters in the latter half of the game. Baigan / Kainazzo - This menu is by far the worst in the game, considering the other menuing. Baigan goes fine, Tellah fails vs. Kainazzo but Cecil and Yang save the day. Save/reset at black chocobo to manipulate consecutive black and yellow chocobo grabs, and guarantees the yellow chocobo leaving to the left later on. Dark Elf – I start to kill off people now to have Kain to rejoin at level 19, as be becomes a beast. We need 2 people dead for Dark Elf, Flame Dog and Magus Sisters to achieve this. Ideally you Virus Cid and kill off Yang here, but Dark Elf weakens Cecil, which wastes time. Flame Dog - Flame dog takes care of Yang, otherwise you struggle killing him with Cecil later on. I also prepare here Cecil's weapon slot to duplicate the Fire sword. Magus Sisters – I AM AWESOME AT MENUS. Dwarven Castle –I don't have to buy Lifes here (luckily) as you need a range between 5267456 – 5267711 GP to land at FuSoYa's Palace in room -47 of the 64 door glitch. I start the glitch here by walking up and down a bunch of stairs. Calbrena – I accidentally parry with Cecil at the end because whoops. Luckily Yang saves the day. This fight can be faster but it relies on a lot of damage luck. Golbez – Can be done at Battle Speed 1 by either run buffering or plinking Kain's Jump. Everybody failed at damage, so had to wait for some text. More pausing happens here to adjust the in game timer. 64 Door glitch – Crazy things ensue. See Pirohiko's TAS for an explanation. Landed in FuSoYa's palace in room -47, the Y coordinate which is frame dependent.